Boxing aficionados will know the name Gentleman Jim Corbett. He was a man of taste and manners, who trod the boards of theatres in San Francisco and New York. He also entered the ring 24 times between 1886 and 1903—including one bout that extended to a brutal 61 rounds—and became the Heavyweight Champion of the World. 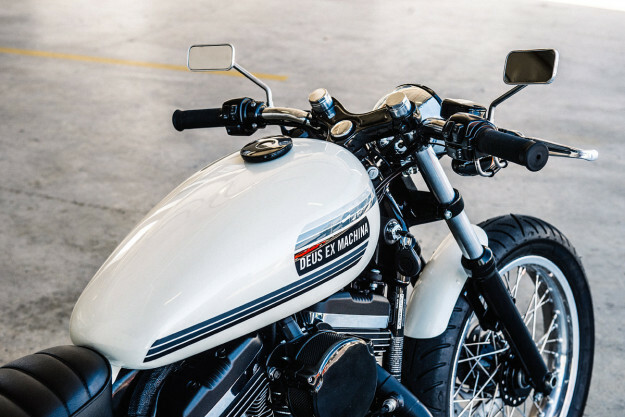 So ‘Gentleman Jim’ is an inspired nickname for the latest custom to roll out of the Deus Customs headquarters in Sydney, Australia. Constructed by master builder and workshop boss Jeremy Tagand, it’s a sublime mix of elegance and power. The classic lines and subtle finishes hark back to the days of fine British iron. 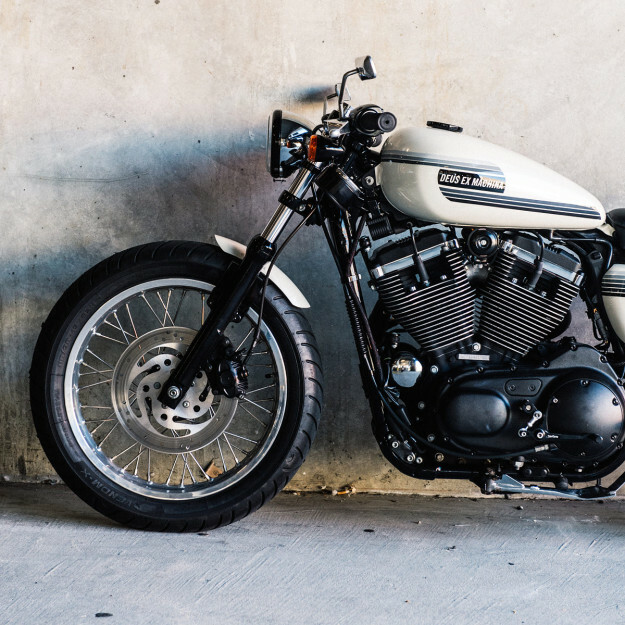 But the heart of this machine is a 2008-spec Harley Davidson XL1200C—better known as the Sportster 1200 Custom. To get the right visual balance, Tagand has taken an unusual approach. And it’s a masterstroke: Rather than use a Norton frame to create a Norley (or is that a Harton?) he’s severed the rear subframe of the Harley and grafted on the back end from a Kawasaki W650. 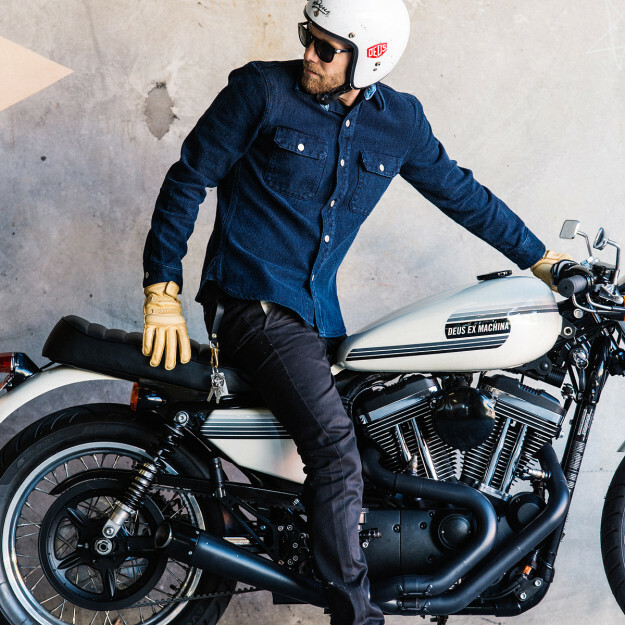 The result is a clean and horizontal line from tank to seat, and a radical change of style for the Harley Sportster. And there’s an added bonus: any replacement seat designed for the W650 or W800 will now fit this bike. Tagand has changed the Sportster’s usual F21/R16 wheel configuration to a more stately F19/R18 setup, with alloy rims laced to custom hubs. He’s also upgraded the fork internals to improve the dynamics, and fitted Ikon shocks to smooth out the ride. The ‘swan neck’ clip-on bars are from Rod Tingate in Melbourne—keeping the cafe styling, without too much lean-forward. The adjustable rearsets are from the Japanese sportbike specialist Sato Racing. On the fabrication front, we’re looking at new fenders front and back, plus a one-off seat unit. 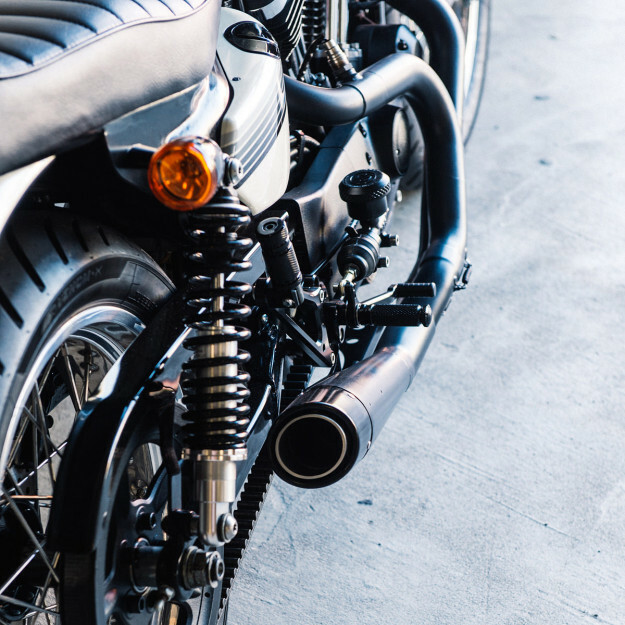 The mirrors, headlight, brake lines and speedo are all aftermarket items; the standard Harley top clamp has been filled in with alloy and smoothed over. 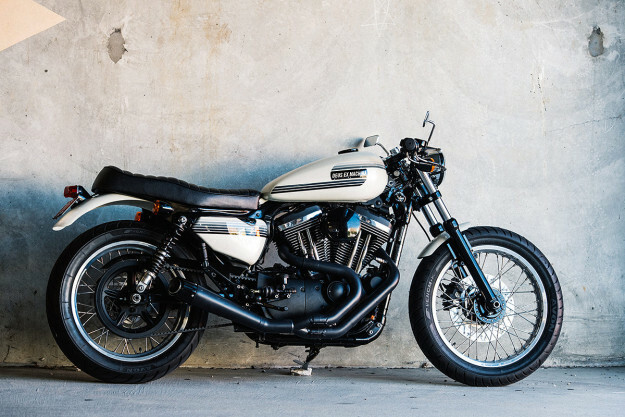 A Roland Sands Design 2-into-1 exhaust supplies a suitably sporty finishing touch, and no doubt a pleasant rasp too. It’s short and tucked in tight, allowing the gorgeous bodywork to shine. 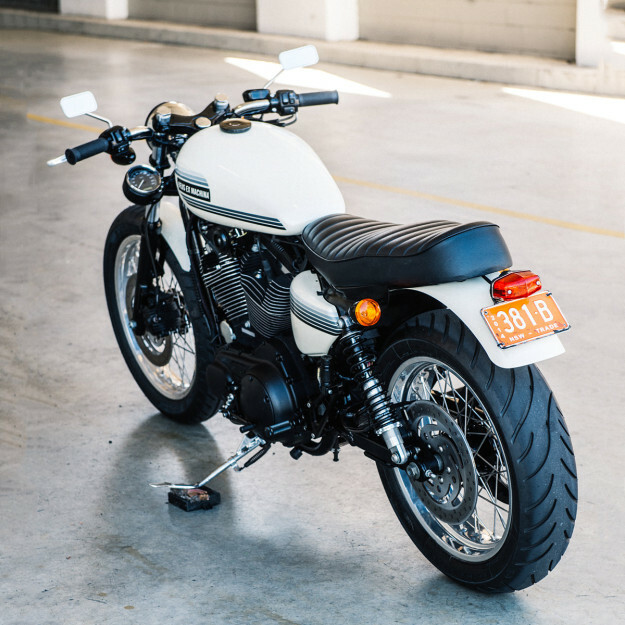 The tank is a standard XL1200C item—and works just perfect with the new W650 back end. 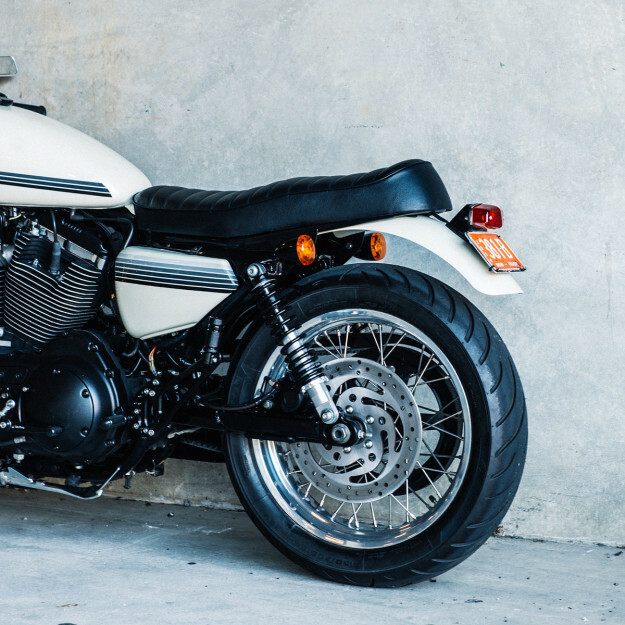 The simple, low-key paint job hints at the AMF Harley days, and ties in beautifully with the satin and gloss black finishes elsewhere. 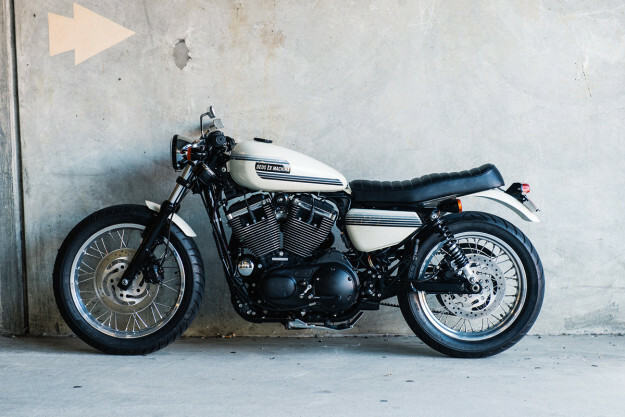 It’s the most elegant Sportster conversion we’ve seen in a long time, and a fine new addition to the Deus Customs oeuvre. Top marks to Monsieur Tagand (sitting on the bike below) for an exceptional build. And how ironic that it should take a Frenchman to pick out the best from the American and English genres of motorcycling.